Saurashtra Cricket Association Stadium, also known as Khandheri Cricket Stadium, is a cricket stadium in Khandheri, about 10 kilometers outside Rajkot, India. 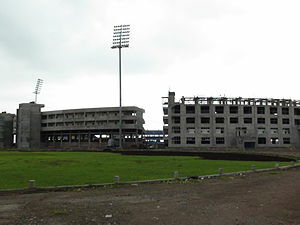 All though many One Day International matches have been played at the Rajkot's Saurashtra Cricket Association ground. Board of Control for Cricket in India (BCCI) had recognized it as a test centre and hosting its first ever test match match on November 9 between India and England. It was the world's 120th venue for the test cricket and the 23rd test venue in India.